Ligonier has much to offer, from the industrial base that provides over 3,500 jobs to the local economy, to the dentists who keep the town smiling. Ligonier is home to over a dozen restaurants, many welcoming churches, and a fine recreational center. The businesses that converge to form our downtown provide a diversity of products and services to their customers. However, the greatest asset that Ligonier possesses is the people who call it home. These people have come together from different backgrounds to form an amazing town. As the legends of Ligonier continue to remind us of our rich history, the community continues to move forward and is continually enriched by its citizens. 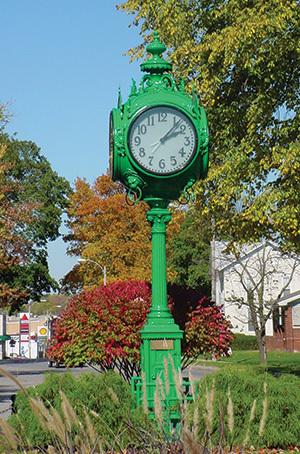 Our town has developed into a city of 30 murals that now grace the downtown along with the quilt garden, 6 sculptures, historic clock, Stone's Tavern & the Ligonier Jewish Temple.